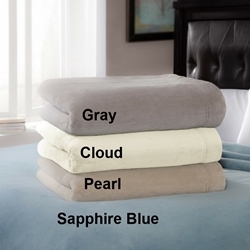 This is Perfect Fit Industries new low voltage electric blanket. It features a patented non-hazardous low voltage technology. This means that the blankets operates on 28 volts vs. the 100 volts found in the traditional bed warming products. MEASUREMENTS: Twin 62" x 84", Full 77" x 84", Queen 84" x 90", King 100" x 90"
The color PEARL has been discontinued.